This entry was posted in Japan and tagged Adventures, Animals, Impressions of daily life, Japanese culture, Mukade, Nature by Haruko-chan. Bookmark the permalink. Firstly, they are not poisonous. They are venomous. Secondly, they will bite from the head end ( as others have pointed out ) and not the rear. We reluctantly room and board with them, or rather, they with us, in our forest home here in Japan. For years I panicked the moment I’d spot one; now I just get the scissors, and hopefully can manage to cut their heads off before they scurry off. From May to late September, it’s mukade season, although the initial surge of them is most unnerving. I have two children, have lived here for over ten years, and not one of us have been bitten. ( knocking on wood here). My feet have found them in slippers, I have shaken them off towels -at times accidently onto my leg – have lightly stepped on them (as they were manouvering their way between tiles) and, despite my enduring gut-reaction, I have come to the conclusin that they are not out to get us. Do they come to harass us while we sleep? Well, if they do, we are not awake to witness it. Pingback: Gadget do dia: Centipede Robot da Tamiya – ZTOP+ZUMO 10 anos! 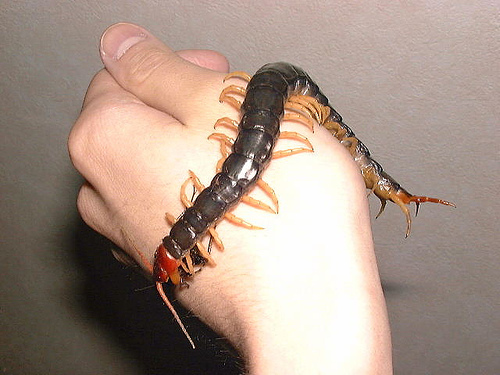 Cool – I have not seen one that big, but centipedes are the carnivorous version (millipedes being vegetarian). I have seen the Japanese hornet (fortunately a dead one) as I was always interested in the signs that said beware of the “poisonous snakes and bees” wondering if the bees were poisonous as well. Sufficiently large I do not want to meet live ones. I am not sure what mukade eat… I have also seen dead Japanese hornets on display. I cannot imagine such a large thing flying around. Terrifying!!! Did you know Japanese honey bees have a defense mechanism against those hornets? When a hornet attacks a nest, lots of bees gather together to form a ball around the hornet. They then flutter their winges very rapidly, thus generating heat. The bees can tolerate a slightly higher body temperature than the hornet so the hornet dies of overheating. Scary! Did you know that Japanese honey bees have a special defense mechanism against these hornets? You can read about it on the hornet’s Wikipedia page https://en.wikipedia.org/wiki/Japanese_giant_hornet My own personal response would be to run away though. Nice blog. Funny story and you tell it well. I lived in Japan when I was little. In Kyushu close to Kumamoto. We saw plenty of mukade! So scary… Dad had one crawling up his leg under his pants once. He hit it (he didn’t know what it was) and it bit him. Not very pleasant. Mum found one in her face cloth. Threw it into the sink, poured hot water on it and tried to smash it with a pill box. I helped one across the road (haha). And another time there was a massive one over my bed when I was about to sleep. I think my parents vacuum cleaned it… Scary things! It seems like your parents were pretty creative at dealing with mukade 🙂 So you weren’t afraid of them as a child? Because you helped one across the road I mean. I love all animals, but for creatures like mukade and spiders, I prefer to admire them from afar. I would be terrified to find one in my bed. Yes, I’ve found that VERY hot water does mukade in. But I don’t recommend smashing or cutting them, as they release a pheromone that attracts others. We had a horrible time of them this year, and just last week dispatched a 5-inch one in the bathroom. But this spring and summer were exceptionally rainy, so I suspect that had something to do with it. A while back someone asked what other scary bugs they might encounter. I’ve got a great one for you – the critters are called geji geji and they’re like a large, mottled mukade with long legs (all dozens of them) kind of like a grasshopper. Fortunately they are more rare than mukade, but I found a dead one in my kitchen yesterday. I think one of our cats did it in (found the remains of a small mouse not too far away). A stray kitten has moved in with us, and he’s proving to be a fearsome hunter. Caught him chasing a mukade across the bathroom floor a couple of mornings ago. Jeepers! I was terrified he’d get bitten! He’s so small it would probably have been very serious. The mukade are just horrible this year. We had the steep hillside right next to our house partially cleared, and I attribute the increase to the fact that the undergrowth where they usually hang out is gone. We’ve killed about a dozen of them in the kitchen and bathroom just in the last 10 days; normally we don’t see that many in a month or longer. My guys seem to be smaller – 7 to 10 cm seems to be the average around here. I don’t care WHAT size they are – they are evil! What’s driving me wild already are the Tiger Mosquitoes. I am allergic to their bites, and every one results in a huge, intensely itchy and oozy bump that goes on for days. Actually, I think most foreigners in Japan have problem with those mosquitoes. I certainly do. I would not call that allergic, since I don’t have all that throat-closing-up-swelling thing, but such tiny mosquitoes leave such huge, itchy, painful bites. Once I got bites so many times, I had to wear scarf over arms in order not to freak out the locals – looked almost like chicken pox, lol. Oh no, Kloseline, as much as you may fear them, leave the SPIDERS alone! They are your allies – you should see the other insect pests they clean up in my house. If you’ve got the majorly big, long-legged ones that are the ugliest color of mottled brown you can think of they are Huntsman Spiders and they are fierce. But they won’t harm you at all unless you threaten them. Don’t do it! As for the little web-weaving ladies, they are allowed to camp out freely in my pantry (or anywhere else for that matter) and they keep the meal moths, beetles, and such under control. Centipedes, roaches (yeah, we do occasionally get a few of them) – kill on sight. No questions asked, no mercy. Although interestingly enough, I’ve been told that centipedes are considered beneficial as they are predators on other vermin. However, the fact that their favorite prey is earthworms totally negates that! Mukade are NOT poisonous. However, they ARE venomous. Venomous organisms deliver or inject venom into other organisms, using a specialized apparatus of some kind (usually fangs or a stinger). The venom is produced in a gland attached to this apparatus. Mukade fall into this category. Poisonous organisms, on the other hand, do not deliver their toxins directly. The entire body, or large parts of it, may contain the poisonous substance. These organisms may be harmful when eaten or touched. Examples include certain types of moths and beetles. Poisonous critters also include frogs, caterpillars, mushrooms and many types of plants. Tomatoes and potato plants, which are members of the Solanum family (which includes what we in the West know as “Deadly NIghtshade”), are poisonous except for the fruit or tubers themselves? Leaves, stems, roots – they’ll do you in. For the longest time, tomatoes themselves were considered poisonous. Lucky for us somebody figured that one out! Oh yeah, and don’t forget apple seeds – they contain cyanide! I have another diversion – our cat, a ginger tom, got attacked by crows and they tore him up pretty good. I don’t know if they were Jungle Crows or the more common Carrion Crows, but those birds are some bad-@$$ guys! Tora screamed himself so that he was completely mute for nearly a week, now he’s up to croaking some. Crow stories, anyone? Or should I start a new blog about the feathered rats? No you are wrong. There is of course difference between poison and venom in definition, but also there is in usage. We can say some kinds of animals have venom (not poison). But when we are saying “they ARE” we say “are poisonous”. We dont really say they are venomous. Venomous means more like they contain a venom. But because mukade’s venom is actually poisonous to human it is all right to say they are poisonous. Thank you for contributing this. The difference between semantics and scientific definitions is indeed a useful distinction! “Poisonous” or “venomous” depends mostly on the method of delivery. Centipedes do fall in a grey area as they don’t really bite and they don’t really sting or exude anything through their bodies, either. But since I’ve been informed that I am wrong, on no uncertain terms and a little rudely, I might add, I will refrain from responding any further. Yes you are wrong because centipedes DO inject venom from their heavily modified front pair of legs. Their ability to inject venom is equal to a spider’s fangs and a scorpion’s stinger. They are venomous, plain and simple. You only say “they are poisonous” because you are uneducated. They are VENOMOUS, plain and simple. I imagine they catch a lot of other bugs, and keep pests under control, being the skilled hunters that they are. As long as they stay in the garden, I think I could live with them. Do you know how many kinds of bugs are edible in Japan? That’s an interesting article! I have actually tried the grasshoppers when I was in Japan. We were walking through a small neighbourhood market in Nagoya and one of the salespeople offered me one to try. I’m not a squeamish eater and will try almost anything once. (I draw the line at endangered species though so I will not eat whale for example. But back to the grasshopper.) It was coated with a sticky, sweet brown sauce, like the ones in your first picture. The sauce had quite a strong flavour so that was pretty much the only thing I tasted. Other than that, the best way to describe it was ‘crunchy’. ^_^ Have you tried any of the bugs in your article? Have you occassionally munched on them or are they a recurring menu item? That sounds scary! Listening to all these stories about scary bugs, I’m so glad I lived in an urban area around Nagoya, and not further south (where it’s warmer with more bugs) or in a rural area. I have heard mukade are smart enough to count to five… so you are NOT safe on floor 5. 5 is their favorite number. Dude- I’m just kidding. I think its safe to assume the 5th floor is the best place to sleep. What a little bakayaro! Those mukade are real pricks, huh? In retrospect, I have lived on the 5th floor for over a year and never found any mukade, or bugs of any kind, in my apartment. So hurray for the 5th floor! As an exchange student in Japan, I was warned by most host parents, who are doctors, that large mukade are poisonous and lethal. Ironically, Ironically, while in a hospital emergency room for an injury, we see a 20-30 cm mukade run across the floor under some beds…And that was my first time seeing one. That is ironic indeed! I guess the mukade doesn’t care if it’s running in a hospital, supermarket or forest. I hope nobody got bitten? Yeah, I guess mukade don’t care where they are … and 20-30cm was a HUGE one! We get maybe 12-14cm ones here. Haruko-chan, I saw a geji-geji (thanks for correcting me on that) high up the bathroom wall when I went there early in the morning. When I returned late afternoon, it was nowhere to be seen. I should turn this old farmhouse into a Japanese Bug Museum! I could charge admission and make a lot of money! I guess sometimes not seeing a bug can be even worse than seeing one! The museum thing has potential. You could already start by photographing all the bugs you find, or making video’s of them and posting them online. I’m sure many people would be interested to see such a thing. Well, I suppose the “hair or the dog that bit you” might work, but for sure I’m not going to try it with mukade venom. And I definitely wouldn’t be choppingt them up. That releases a pheromone that attracts even more of them. BTW, found a medium-large mukade in my kitchen a few days ago, and a medium-size one in my bathroom this morning. It is September, so they should almost never around now. I wonder what’s up? But we’ve had exceedingly weird weather here in our neck of the woods. 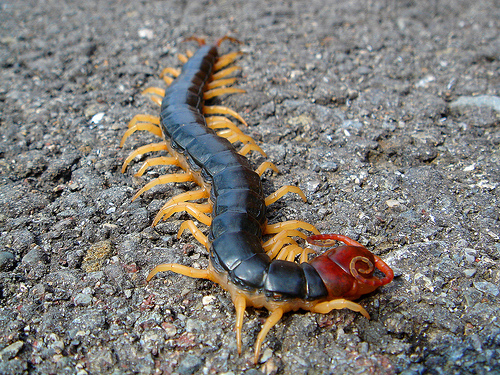 Oooooo we live in South Korea and I think it’s the same centipede we get here……. We do spray so they are at least dopey and yes I chop them with scissors….. Barbaric I know but fastest way to deal with them. I understand they have very good medicinal properties too but don’t like sharing my bed or my children’s beds with them. I’ve read about far worse things done to mukade (boiling, burning alive, …). I also read that in the old days, people would drown them in oil and then use that oil to treat burns and (ironically) mukade bites. Was just in Japan and this last weekend I was out to eat with a friend. E were sitting in the zashiki (legs down under the table) when I felt a pinch on my big toe. My immediate response is to immediately brush off the small grayish looking spidery thing. But the stinging feeling did not stop. That’s when my friend tells me it was probably a centipede. We searched for it and found one ant, and one ant-like bug that, unlike the ant, was not afraid of the chopsticks I was using to pick it up. It had a huge set of pinchers. My toe felt like it was being stung repeatedly for hours. And no one knew how to treat it. But I’m alive! If it was a small mukade (as I infer from your story) the bite will definitely not put you in any real danger. But it is still adviseable to seek medical advice upon being bitten. Are you still in pain now, or has it healed on its own? Audrey, I know I lack a vivid imagination, but mukade and kumo (spiders) don’t look ANYTHING alike to me. If it was gray-ish and looked more like a spider, I’m guessing it was what the Japanese charmingly name “gudgi-gudgi” (“good-gee good-gee”) – it’s shorter than a mukade, with long legs that are short front and back and get long in their middle, to make the overall shape of the thing kind of oval. Scary-looking to be sure, but they’re not as harmful as mukade. I got the wrath of a gudgi-gudgi once, in the shower (what is it about my bathroom?) and although it hurt like heck for about 3 hours, I slabbed some bite-and-sting creme on it and that was the end of it. This summer, our scourge if you can call it that, is kumo, especially the Huntsmans – they are all over the place! 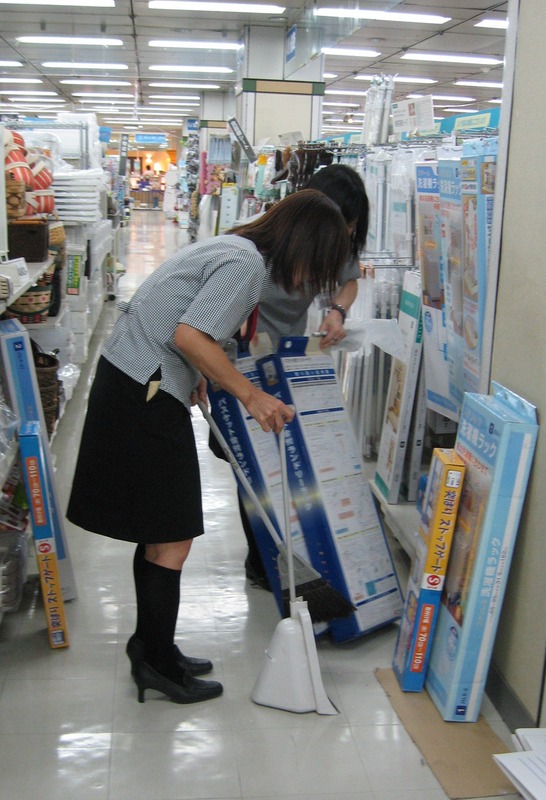 The good news is, it is a white-hot summer down here in Iwakuni, and so the other nasties, especially the mosquitoes, flies, and meal moths, are creating a massive target-rich environment. Ah, the joys of country living! *geji geji げじげじ （not gudge gudge）non harmful unlike the mukade, i had one in my shoe the other day. Over 10 cm, Nasty. I did not realize for 30 mins until it tried to escape! It took me and my staff all day to locate it. While they may not be harmful, they still looke quite scary to me. I wouldn’t be very comfortable finding one in my home… Did you find it in the end? I’ve got another creepie-crawlie for you, classified as a centipede by Google, anyway. It’s got LONG black legs, all the same length (not like a geji-geji) and its body is sort of speckled/striped. It was in my bathroom (AGAIN!!! that room!) and it was about 1-1/2 inches long. Looked scary enough that I just zapped it with the Kinchol insecticide spray and it dropped in its tracks, but I couldn’t find a picture of it on the spray can. Ah, the joys of country living! BTW, 9/16 I watched in morbid fascination as a spider trapped and killed a 1-1/2 inch mukade in her web in a corner of my kitchen, and the spider won the day! But it was pretty gruesome to observe … and the spider, legs and all, was only about half again the size of the mukade’s head! All those animals in your house… You must really live in the middle of nature. I’m not sure what I’d rather have in my house: mukade or spiders that eat mukade. You’re right, it’s gegi-gegi. I got the katakana wrong – sorry I’m getting ready for cataract surgery so I can’t see the accent marks too well. Does any know the other long-legged centipede with spots & stripes on its body? Give me the kumo ANY day! Our house is old with may nooks and crannies and in the countryside; some rooms and places not visited frequently, and we not only have huntsman spiders, we’ve got the ones that spin webs, too. You should see the critters they get rid of. I was taught by my grandmother that it is bad luck to kill a spider, and now that I know WHY, I leave them alone. So far, not one spider has ever attacked or bitten any one of us humans or the cat. Never witnessed that a spider had ever killed or eaten a mukade, but I can tell you that kuro-ari will attack them with a vengeance! Wish I could say the same for those d@^^eD Tiger Mosquitoes. I’ll be nothing but a solid mass of itchy, nasty bites (which don’t go away for several weeks) forever! Are the yabuka the same as the Asian Tiger Mosquitoes, the black & white striped ones? Because they are the ones who are making my life miserable. They will NOT stop going after you! And when they get you, the bites get horribly itchy and red, then when you scratch them they make big holes in your skin which don’t go away for many, many days. Yuck! Yes, yabuka is the same as tiger mosquitoes. I quote Wikipedia: “They are always on the search for a host and are both persistent and cautious when it comes to their blood meal and host location.” I hope the weather soon cools down and the mosquitoes go away. I just found your post after a Mukade crawl under my t-shirt on my lower back while I was working on my computer late at night. I felt something tickling me and by reflex checking with my hand. At first I thought it was a grasshopper but when when I chased it, a Mukade fell on the floor and ran toward the door. I think its outside now, but I can’t sleep and can’t stop looking around. I wasn’t bitten but my skin is a bit red . There are many dark places in my apartment, why come at me ? Maybe because I am wearing a black t-shirt ? That’s some bad luck! At least you weren’t bitten. I live in Iwate and was taking a shower with my three year old son about two months ago when he says ‘look there’s a bug!’ There it was crawling on the wall, about as big as the one you saw in the market. Without knowing anything about them I washed it into the drain and smashed it in half with the little shower bucket, then threw it in the trash later. I later learned that you aren’t supposed to smash them as they release a pheromone to attract others, nor are you supposed to cut them in half, as the head half isn’t supposed to die. Fortunately we haven’t seen any since. And very fortunately I was in the shower not my Japanese wife. Jon, the advice you were given about not smashing or cutting up mukade is correct, according to my Japanese friends. The only way to prevent the release of the pheromones is to burn them, (most of my friends use a long-barrel BBQ lighter) but in a house full of tatami-mat floors that can get a bit tricky! I’ve also had good luck with boiling hot water, but it still takes them a few minutes to give up the ghost. BTW, that’s how my hubby got into trouble; I had sprayed the one we found in the kitchen, and despite my desperate pleas he picked it up while it was still alive – and, no doubt, not in the best of moods. You live far north of me (I’m in Iwakuni, Yamaguchi Prefecture) in an old traditional-style farmhouse on the outskirts of the city. We are surrounded by woods, vacant lots, and community garden plots – mukade heaven! However, although Rainy Season was late this year, we haven’t seen any of them other than a couple of dead ones since my husband got bitten about 6 weeks ago. His right little finger, BTW, still isn’t right – it is still discolored and continues to burn and go numb by turns down the outside of his hand to beyond his wrist. Our fault for not seeking medical attention immediately; by the time he decided to go for help (about 3 days later) it was too late. So, I reiterate to all – if you get bitten, especially by a large one, GET MEDICAL ATTENTION ASAP! Sounds like your husband may be allergic to its venom. I’m having a hard time falling asleep, since I found one of these scary animals between my bed sheets. I fear this storry just made it worse 😉 But, although there seem to be really a lot of them, acording to how many dead ones you can see on the streets, I’ve asked a lot of people here and so far haven’t met anyone, local or international, who ever got bitten by one of these fellows. And even if it happens, it will hurt (badly), but that’s it. Thank you for the reblog and the extra exposure ^_^ Good luck with your blog as well. It looks great! bejasus ! – and here I was reading up for my dream of living in rural Japan ! I think you’ve given me nightmares – the dreaded mukade ! Every dream requires sacrifice! ^_^ I always say, if the local people can get used to it, why shouldn’t I? I do have to admit that I have never lived in rural Japan. Maybe I would be saying entirely different things if I found mukade in my bed or in my shoes on a regular basis. Please don’t let mukade quash your dream of living in rural Japan. Trust me, there are many, many things that outweigh them. First of all, they’re pretty predictably seasonal; mid-May to mid-June is when you’re most likely to find them invading your territory. Secondly, they are solitary hunters; you will not see them running around your place in hordes like some misguided scene from “Arachnophobia” – BTW, spiders don’t run in hordes either, except the occasional newly hatched guys; they’re a little like baby sea turtles. But if you guys want a true horror story about spiders, let me tell you about the “Huntsman Spider” – or just Goodle it. They are the scariest beasties you can imagine, but totally harmless to humans and animals … and they rid your house of other nasties you’d rather not have – like flies, mosquitoes, roaches, etc. They do not spin webs, but run their prey down – hence the name. You just have to get used to big, mottled grey/brown arachnids that can span the palm of your hand and remain totally motionless until they see something worth going after (which won’t be you) or you startle them. And then, baby, you talk about greased lightning! We’ve lived in this farm house for 6 years, and in a house closer into town 10 years before that, and I can honestly say that in all that time and in both residences I’ve encountered maybe 2 dozen of them. Do the math. Mostly, they will just get out of your way if they can. To my surprise, mukade (or all centipedes, for that matter) are considered beneficial because they are predatory on aforesaid pests. The downside is their favorite munch-a-licious is earthworms. Want to hear about the giant leather-wing moths next? Bwaa-haa-haah! I found one this Memorial Day weekend in Independence Kansas I tried to copy a pic on to here but it wouldn’t let me. Are these common to the United States ? I am not sure if mukade exist in the United States. Of course mukade are a kind of centipedes, and I think centipedes exist all over the world. So maybe you just saw a local kind of centipede? Jeff, the centipedes in the US are a different “animal”. The mukade are Japanese critters. without seeing a picture, I can only guess. If the critter was medium-bodied with very long legs, then it was’t a true mukade. What we have here in Japan, true mukade, I don’t think exist anywhere else, so in Kansas you’re probably safe. There are also millipedes, which is I’m thinking what you saw. They look scary but are harmless to humans. Centipedes, our true MUKADE, on the other hand. are not. My husband’s right little finger, one month after the bite, is just atrocious. It is still black/purple/.blue swollen, and now the joint (the middle one) is becoming what I can only describe as becoming necrotic. It’s calloused, white crusted, and he goes from white-hot sensation to total numbness from his little finger down the outside side of his hand to above his wrist. Stubborn man that he is (he underwent totally successful heart surgery in February), he will not seek professional medical attention. It may be too late anyway. I’m just worried he’s going to lose that finger, or part of it. DON’T GET BITTEN BY MUKADE! IF YOU DO, SEEK MEDICAL ATTENTION AND I MEAN, IMMEDIATELY! Firstly, even, if you see a mukade perfectly still, do NOT assume it is dead. It probably is not. Make sure you kill it first, by whatever remote control you can grab, before you attemp to handle it. I live in Yamaguchi Prefecture, in a big old Japanese farmhouse, and I can tell you that mukade are the bane of my existence here. My husband just got bitten on his pinky finger by a pretty large one (about 5-1/2 inches) and he’s in considerable pain. I had zapped it with a special mukade killer spray, and while the thing was still writheing around (they are devlish hard to kill) he picked it up in a paper towel, but it bit him anyway. Now he has a very painful bite. As some others have noted, the mukade bite is seldom fatal, but they are quite painful for several days and can put small children or older folks in the hospital for a day or two. The mukade in the supermarket was most likely running toward the person because you were casting a shadow, and they always run toward dark places, out of the light. Someone else was right; they are quite fast and aggressive but they’ll only go for you if they are threatened. Our bedroom is on the second floor, and I’ve never seen one up there. They mostly appear in the kitchen sink or the bathroom (moisture). The one that got my husband came out from under the dishwasher. Now I’ve got the ultimate fright story. While I was bare-naked in the shower one morning (in Japanese bathrooms, the entire room is the shower/soaking tub), a 6-incher ran right out from the floor drain, around my ankle and over my foot. Jeepers! That part about the dark places makes sense. 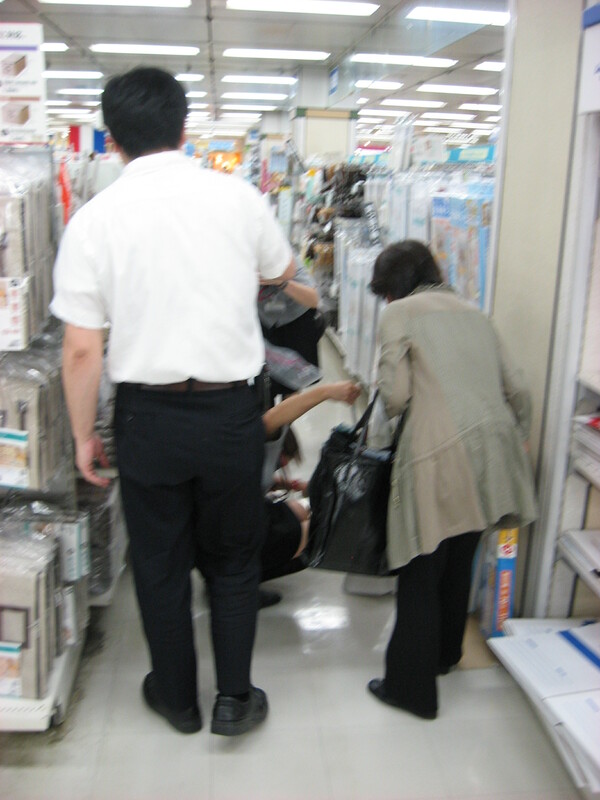 When I moved away from the mukade in the supermarket, it hid under the shelves. During my research for this article, I read about someone who picks up the mukades with chopsticks (rather than for example with a paper towel). The article did come with a warning to only try this if you feel very confident with chopsticks. Chopsticks are a good idea only if you’re quite good with them (think Mr. Miyagi in “The Karate Kid”). My Japanese friends tell me boiling-hot water is a sure thing, but that can be problematic unless you keep a kettle on the stove all the time or your tap-water gets really hot really fast (mine, fortunately, does). Anyway, another neighbor uses long BBQ tongs to grab the mukade, and then his wife fries them with a BBQ charcoal-lighter gun. You could do this by yourself, but then again it requires the necessary equipment to be where you need it, when you need it. Mukade don’t wait around for you to zap them! My husband’s pinky is now about the size of his thumb and looks like the underside of a thunder cloud. Yecch! He is feeling the pain about halfway up to his elbow. Johnny D is right, mukade deliver the venom by forcipules – a modified pair of legs right behind their heads. They do not bite-they have no true fangs, and they do not sting. Those long appendages at their hind end are strictly “feelers” – well, if the end of your body was as far away from your head as theirs are, wouldn’t you want some sort of warning system? Thanks for all the mukade extermination tips ^_^ I’m sure other people reading this post will find them helpful. I hope your husband will be okay soon. Hi there! I could have sworn I’ve visited your blog before but after browsing through a few of the posts I realized it’s new to me. Thank you for liking my post on the watermelon game. You are welcome! It was very interesting. Scary! I’m so happy I never had one in my house. I guess it’s thanks to living on the fifth floor. Although I would love living closer to nature, the abundance and toxicity of Japanese wildlife scares me a little. The centipedes don’t sting with their tail. It looks like a stinger, but it might just be for show — to distract potential predators from the actual dangerous end. The first set of legs behind the head is actually the poison source. I’ve watched them “bite” pencils and sticks. You can actually see drops of poison when they attack. Ouchhh!!!! They are so scary! The only one I have seen since writing this post is a baby mukade of just 1 cm. I hope I don’t meet a big one any time soon. Hi, I worked in an isolated place (we didn´t even have electricity for instance) in the mountains of Kumamoto´s countryside during the rainy season for 3 years. It was normal to see mukades 10 times a day maybe (and there was a good load of snakes too, etc.). I think there´s no much myth in the information you gathered, both things happened to me, once a mukade dropped itself from high on the wall and fell over my hand as i entered the toilet and closed the door, it didn`t have time to bite me. And also once a mukade climbed up to my futon and up over my pillow and started chewing my pinky, which woke me up. Both times they were baby mukades. When we talk about the mukade bite: actually they bite the scorpion way, they have the poison in a double needle they have in the rear top end of their bodies, while they eat with their mouth. I have no idea why that mukade was biteing my finger. After that I made a ring with special killer for mukades in spry. In the whole time I stayed in Japan I was never bitten by a mukade myself (with the tail and poison I mean) but we had a few cases every year. Always was either that the mukade was inside the shoe and the person didnt check before, or the person put the hand in a place without checking properly. Thus I always think mukades are not really aggresive, they only attack when trapped and scared. I don´t know why that mukade in the supermarket ran towards you. I would rather think it was out of confusion and panick. Is that possible? Thank you for that interesting story! Although I do believe you when you say that mukade aren’t really agressive, the thought of working in a place with that many mukade still gives me the chills 🙂 But in any case now I know to always check my shoes and to not put my hand inside possible mukade hiding places. I’d like to think the mukade in the supermarket was running towards me either a) to scare me off or b) to pose for the picture, but more likely it was just a coincidence. 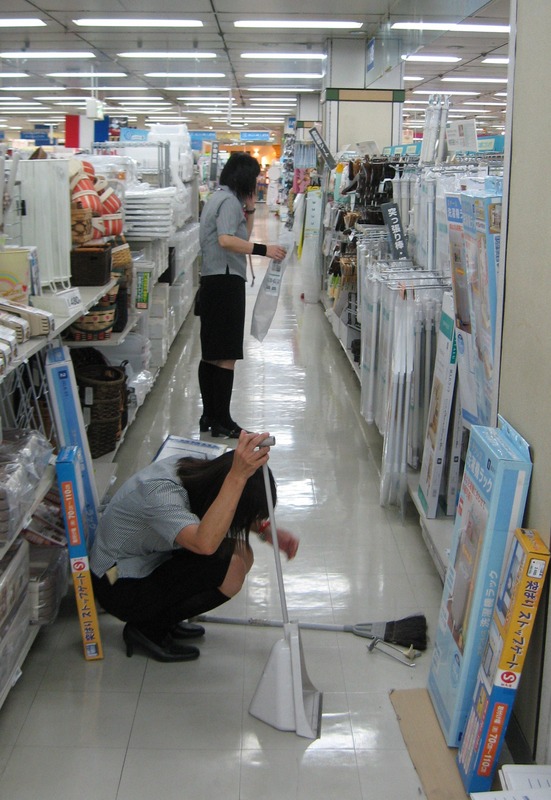 If you are used to Australian bugs, you should be fine in Japan 🙂 The pictures I have seen and the stories I have heard about Australian bugs give me the creeps! Nope, they bite with a modified leg behind their head called forcipules. I am learning so much about mukade! Thank you for pointing this out Johnny. 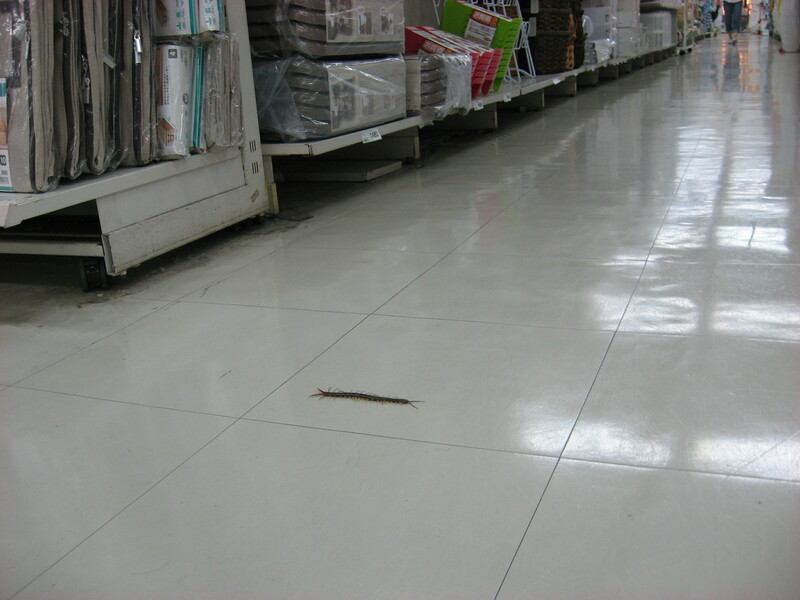 Yasuko-san told me later that the centipede is also regarded as a lucky symbol of “gathering a lot of customers”. Why? Because of it’s many feet. I wouldn’t worry about it too much. Sometimes a dead centipede is just a dead centipede.